The sun is an unrelenting foe when it comes to aging and fading of upholstery, carpet, drapes, and even wood floors. 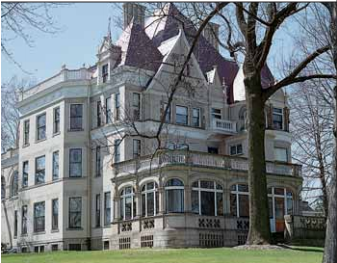 So when a historic home in Pittsburgh required protection from the damaging effects of the sun, 3M window films came to the rescue. Tintmaster of Sacramento brings you the story. The Clayton Mansion in Pittsburgh was built in 1860. This Victorian home featured pieces of art, antiques, rare fabrics, handpainted wallpaper, and other priceless and irreplaceable items that needed to be protected from the sun’s UV rays. In 1990, the mansion underwent a $6 million renovation of the first two floors. Protecting the furnishings and floors was a major priority. Covering the windows on the first two floors with window film was the solution. Not just any window film would do. Since window film did not exist in the 1800s, the protective film must be undetectable to any of the mansion’s visitors. The solution was 3M’s Neutral 50 window film. It provided the protection needed without any noticeable change to the appearance of the windows. In fact, you can’t tell any difference between the windows on the first two floors and the windows on the third floor that have no film. Because of the cost of the project and the value of the items being protected, only 3M window film was considered for the project. At last report, eight years after the installation, no furnishings had been lost to fading or sun damage. The window film continues to adhere tightly to the windows, including curved windows, and no one even knows the window film exists! It’s a beautiful example of how adding a modern improvement can help preserve a piece of the past. At Tintmaster of Sacramento, when it comes to quality, we stand behind our products. We use only the best window films including 3M and Solar Gard. Adhesive is the number one concern we have when it comes to quality, and after years of installing window tinting, these two companies have proven to be the most dependable. Our window film adhesives will not crack, peel, or bubble off the glass once installed. If you’re looking for window film for your home, business, automobile, boat, or motorhome, give us a call at (916) 852-8468 and we’ll be happy to give you all of your options and stand behind it with our 10-year warranty on parts and labor.